Sing, and sing some more! Your haikus are great, Jenn! I feel like they come so easily to everyone else and flow so well! Mine are ready to go, just waiting to post them so they go up tomorrow. even next week also same topic? how come? Oh crap, I knew I forgot something!! Will change that now – thanks Leo!! Wonderful haiku to start this year. That’s a full packed resolution to me. I’m so with you on this, except for the singing part. My voice is best kept to myself ;). Have a great day. Happy New Year….wonderful Haiku as always, I especially like the middle one and this year will be groovier still! These are great! Love the groovy!!! Singing your way through the year is not a bad way to go! Must admit mine is cynical. Hi Jenn, I am not able to see the linky.. So I am leaving my link here.. 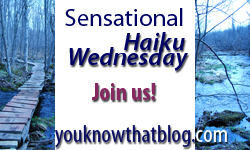 Wonderful upbeat Haiku Jenn – lovely! Resolving to continue doing that which makes you happy and improves your life is wisdom, I think. I am sorry I am late. I would promise to do better, but anymore my life is claiming my blogging time! I’m a day late and I didn’t even realize til I read quilly’s comment. Oops. I love these, you’re very good at this :) I would never have thought of making a list haiku, wow.